The Constitution sets out ‘the achievement of equality’ as a founding value. The origins of the protest are of course a conflict over payment: a conflict over the value of work. One likely common factor in relation to both the origins of the miners’ protests and the violent turn of events is the extreme inequalities which exist in South Africa. Nowhere is this more vividly displayed than in the digging for platinum, one of the most precious metals in the world, for a meagre salary while company executives live in luxury. While most would agree that the extreme inequality in South Africa is a problem, opinions on how to address this problem obviously differ. Perhaps it is true that to meet the salary demands of the workers would bankrupt the mining company and therefore just lead to higher unemployment. But if it is not possible to meet the workers’ demands, at least it should be possible to limit pay among those who earn the most. 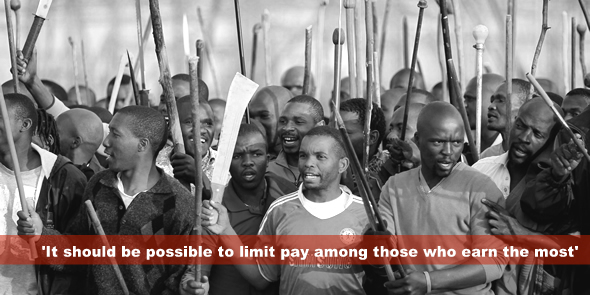 Perhaps there is a need in South Africa not only to regulate minimum wages but maximum wages. Measures to create equal opportunity should not be with the aim of having equal opportunity to rise to the class of exploiters. The aftermath of the Marikana incident also raises issues of fair trial rights. Concerns may be raised with regard to how the arrested persons are dealt with. Over 200 arrested persons were remanded in custody on 20 August for further investigation and a new hearing set for a week later. This procedure is allowed under article 50(6)(d)(i) of the Criminal Procedure Act which provides that a bail hearing may be postponed for seven days at a time if the Court is of the opinion that it has ‘insufficient information or evidence at its disposal to reach a decision on the bail application’. However, the necessity to keep a person in custody should be considered on an individual basis. Was there clearly insufficient information in relation to all the individuals? Does the justice system have sufficient resources to handle cases of this nature? Public violence is clearly a crime with collective dimensions but each participant must still be judged on his or her own participation (Le Roux and Others v S (444/08)  ZASCA) 7). Violence should not be condoned, but there are clearly interests that stand against each other. Sole breadwinners stand to lose their jobs if they cannot return to work, for example, due to delays in the proceedings against them. National rule of law co-exists with international supervision. It is therefore a pity that South Africa despite its constitutional obligation to uphold the rule of law supported a decision of the SADC Summit on 18 August to finally put the nail in the coffin on the SADC Tribunal which has been moribund for the last couple of years. (see Final communiqué of the 32nd summit of SADC Heads of State and Government, Maputo, Mozambique, August 18, 2012, para 24). The activities of the Tribunal were suspended since 2010 after Zimbabwe got upset over an adverse judgment. Why would SADC member states establish a Tribunal with individual access in the first place only to dismantle it a few years later? The dismantling of the SADC Tribunal does not augur well for the rule of law in Southern Africa and is not very promising for the future of the regional human rights court, the African Court on Human and Peoples’ Rights. It remains to be seen what will happen if this court would deliver a judgment with which a state strongly disagrees with. Hopefully in such a scenario there would be a sufficient number of states that would stand up for the rule of law. South Africa should be one of them. Dr Magnus Killander is Senior Lecturer and Head of Research at the Centre for Human Rights, Faculty of Law, University of Pretoria. I am glad Dr. Killander identified the principle of the rule of law, in what is a labour issue, and alighted this doctrine with what are the founding principles of our constitution. The rule of law remains an unalienable and omnipotent principle that ought to be respected by SADC, especially South Africa, and the Tribunal was at best positioned to promote and protect the rule of law in the SADC area, as contend by Killander. Very good points Magnus, I should also stress that the dismantling of the SADC Tribunal is a bad precedent which seems to be inspiring EAC Heads of States with regard to the growing human rights jurisprudence of the East African Court of Justice. Very informative piece of writing, some of us had just read it on the news from a distance, but now we get a full expert analysis about the terrible incident. Cyril Ramaphosa is guilty of oppressing his own people, who under paying these workers, for taking the bulk of their wages and give them only R5 500 of the R12 500 they actually get from the Mine per worker per month. Who is the oppressor here, whose the slave master here, Cyril owns the lablour broker this workers work for and at the same own shares in the Mines which makes him a director at that Mines, gives him umlimited powers to what ever he think is right. The only thing Lonmin Mine is guilty of is allowing the workers to work for a labour broker instead of employing the workers directly, then this workers wouldnt strike in the first place. And the other truth this mine does not belongs to the current directors, it is dispossessed mine from the KhoiSan people and their communities of South Africa….